This is an update to my initial post about new AutoCAD features by version. This one adds AutoCAD 2014 to the list. As was previously stated: With each new version of AutoCAD there is typically a mass public release of blog posts, web updates and press releases with what the newest version does compared to the last or previous versions. This is helpful for those that are considering making the move, but many skip multiple releases before taking the plunge. The purpose of this Matrix is to let those know that may wait a long time between updates that there is often way more than just the current “New Features”. AutoCAD 2014 for example has “4” NEW features, but a lot of enhancements to features that exist but are probably still new to many users. If the new features alone convince you to purchase, then that’s great, but if you are on the fence, take a look at all new features introduced since your version and be sure to look in to one some of them can do for you. Below are a couple links with more information about the changes made in AutoCAD 2014. The first is a series of videos from Autodesk and the second is a write-up on the “CAD-a-Blog” blog site by Brian Benton. Note that I am a bit behind on this versions update, so you should know that Autodesk has recently released ‘Service Pack 1‘ for AutoCAD 2014. Many companies, all over the world that take the plunge are very often modifying the new versions of AutoCAD through the menu systems, toolbar changes and shortcut commands to get back as close to the old way of doing things as they can get, because “they cannot afford to be inefficient while learning the new software”. It would be unfortunate for these companies to be using the latest version of AutoCAD in their old way, not realizing that some of the most efficient new features are buried just below the surface. If these users learned more than just the tools that they typically use, they could be even more productive. To educate some of these users as to a lot of the features that they may not even know exists, I have put together an AutoCAD Features by Version list and saved it here as a downloadable and printable PDF. 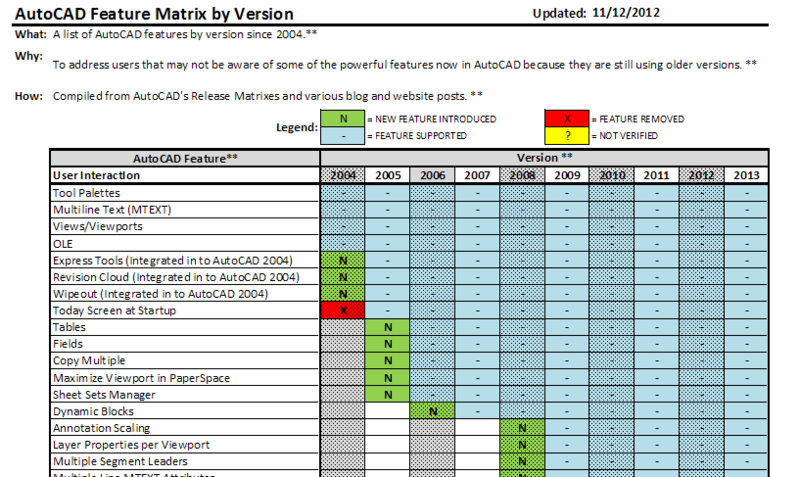 A list of AutoCAD features by version since 2004. To address users that may not be aware of some of the powerful features now in AutoCAD because they are still using older versions or using the new version just like their previous one. Compiled from AutoCAD’s Release Matrices and various blog and website posts. This list is not 100% accurate, but is hopefully pretty close to the actual new features introduced for each release of AutoCAD. This list was composed from various Autodesk’s release comparison matrices, blog posts and websites that discussed each release as they came out. 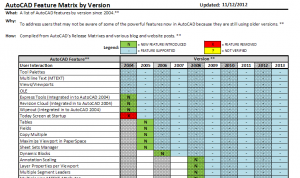 The Autodesk matrices were not consistent as to how the products were indicated as new and improved and each Matrix release had an inconsistent set of categories, so the mergers of features may be off. Although I started out showing which features were improved with each version, that become very cumbersome so I removed it. AutoCAD gets improvements on a regular basis, so the most exciting thing is when a completely new feature gets implemented. This is meant to be a living document that will be updated as new versions come out and corrections brought to light. If you are aware of any discrepancies or are aware of an Autodesk version or other source that has created a more comprehensive version of this list, I would love to hear about it. Are you Ready for Autodesk University 2016? AutoCAD BAD CAD Blocks Hell!